Energy efficiency is a number one priority for many homeowners in Mantorville Minnesota. If you're looking to hire an insulation contractor for attic insulation, injection foam, soundproofing, ice dam removal or anything else to do with insulation give us a call. Ryan Insulation is a licensed contractor, offering the very best in energy efficient insulation. Upgrading your home's insulation is one of the easiest and most affordable ways to improve your home's energy efficiency level. Many homeowners find that their new insulation pays for itself after only a short while, giving a better return on investment. Ryan Insulation runs a full time insulation team, with certified professionals. Today's insulation products are better than ever, performing better and lasting longer. Many homes in Southern Minnesota have low grade insulation or insulation that is degraded with age. We utilize CertainTeed's InsulSafe SP insulation. This high performing affordable insulation is 2nd to none when it comes to improving a home's R-Value level. Some homes in Mantorville experience ice dams. 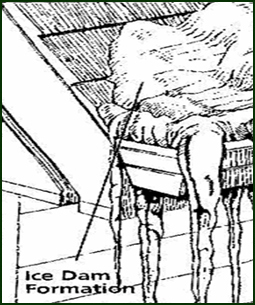 Ice dams can often be reduced or eliminated by increasing or upgrading your attics insulation. During the winter Ryan's offers a fast ice dam removal / prevention service. If your Mantorville home is subject to ice dam formations give us a call.